Acyl carrier protein synthase (AcpS) is an enzyme that plays a crucial role in the functional activation of acyl carrier protein (Acp) in the fatty acid biosynthesis (FAB) pathway in bacteria. It catalyzes the transfer of the 4'-phosphonopan-tetheinyl moiety of CoA to the side chain of a conserved Ser residue on apo-Acp (inactive) to generate holo-Acp (active). Holo-Acp reacts with acetyl-CoA/malonyl-CoA and carries all intermediates in the fatty acid biosynthesis pathway. AcpS is required for the biosynthesis of important components of membrane lipids and bacterial lipopolysaccharides, so the inhibition of bacterial AcpS is a potentially novel approach to antibacterial therapy (Gilbert et al., 2004). Wyeth ran a high throughput screen against B. subtilis AcpS and two of the hits that were identified are furosemide (1) and an oxazolone compound (2) (Figure 3). Gilbert, 2004). Both compounds were deemed suitable starting points for further synthetic work because X-ray co-crystal structures were available to guide compound design. The crystal structure of compound 1 with B. subtilis AcpS indicated that there was room for larger hydrophobic substituents in the region occupied by the furanylmethyl group. An array of twenty-four compounds was synthesized where the furanylmethyl group was replaced with a variety of substituents derived from a diverse set of aldehydes through reductive amination. An analog (3) was identified with weak antibacterial activity (MIC 50 |M) and slightly improved permeability (0.15 x 10-6 cm/sec) but with an enzyme IC50 >20 |M. The MIC activity of the analogs in this series can be improved by increasing the lipophilicity of the N(2) substituent and this observation was validated by a multicomponent PLS model. However, there is no correlation between enzyme inhibition and antibacterial activity. Additional compounds were synthesized, but again, no correlation was found between enzyme inhibition and antibacterial activity, so the series was dropped from further consideration. Structural information for compound 2 indicated that several regions of the molecule could accommodate additional substituents. When optimizing a hit with more than one region that can be varied, it is important to not vary only one group at a time while holding the others constant. The strategy of changing one separate factor at a time (COST) does not necessarily lead to the optimal compound. Systems influenced by more than one factor are poorly studied by the COST strategy (Eriksson et al., 2000). To avoid missing an optimal compound without having to synthesize every possible combination of substituents (which could require the synthesis of many thousands of compounds), the use of a Design of Experiments (DoE) approach is both efficient and can lead one towards the optimal combination of substituents. Using DoE, one avoids synthesizing redundant compounds and obtains the maximum amount of structure activity relationship (SAR) information through the synthesis of a relatively small number of representative compounds (Figure 4). Also, a designed set of compounds can give a better PLS model. Using a D-optimal design (Eriksson et al., 2000) generated with MODDE (www.umetrics.com) an initial screening set of forty-two analogs of compound 2 was designed and synthesized, and the biological testing results were analyzed by PLS (Gilbert et al., 2004). A PLS model can be used to correlate the variation in chemical structure as described by a data matrix X to biological responses as described by data matrix Y. Two PLS models were generated for the screening set of forty-two compounds: one that correlates physicochemical properties with AcpS inhibition (two components, R2X 0.50, R2Y 0.71, Q2cum 0.63) and a model that correlates physicochemical properties, AcpS inhibition, and antibacterial activity (two components, R2X 0.50, R2Y 0.44, Q2cum 0.29). 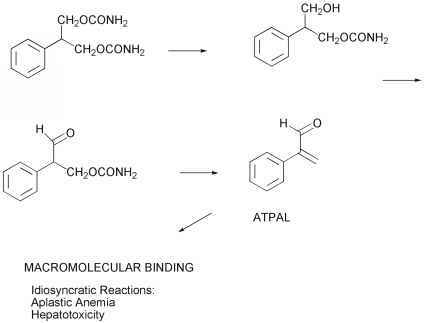 These models suggested that the focus for the next array of analogs should be on an overall increase in lipophilicity for the compounds and an increase in the lipophilicity and molecular weight of the substituents on the terminal phenyl ring (occupied by a chlorine in compound 2). A second optimization set of sixty-nine analogs of compound 2 was designed with a D-optimal design, synthesized, and tested. A number of analogs with improved enzyme inhibition (IC50) and antibacterial activity (MIC) were identified. Compound 4 has the best overall profile with a B. subtilis AcpS IC50 of 0.27 |M, a B. subtilis MIC of 25 |M, and PAMPA permeability of 0.67 x 10-6cm/sec. However, aqueous solubility remains low. Substituents that improved the permeability of the compounds as measured by PAMPA tended to have improved antibacterial activity.